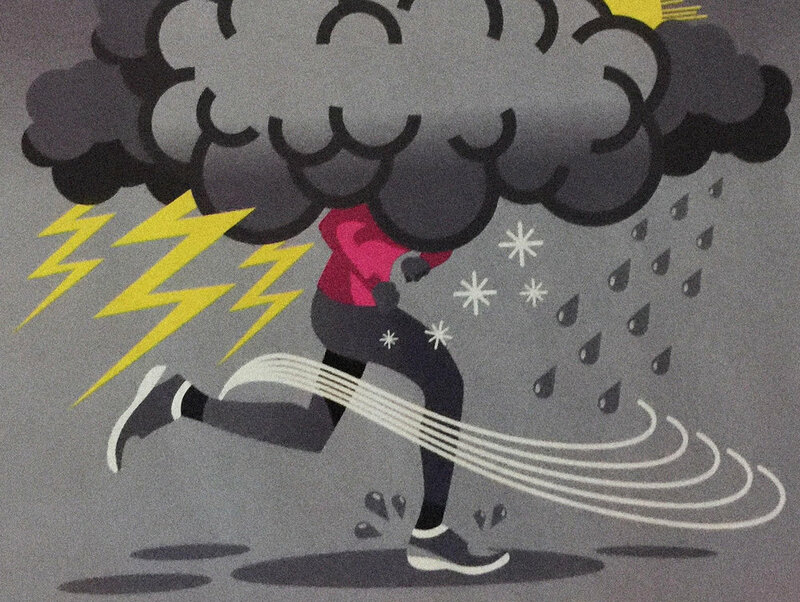 I have long regarded the weather as a troublemaker when it comes to running. Many a time I’ve cursed it – in its many guises – for interfering with my plans; turning the track into an ice rink, the trail into a quagmire and once, throwing a headwind into the path of a potential half-marathon PB along Hastings seafront. When I’m made the effort to get out there, it seems unjust that my running should be compromised by the whims of the weather. Oi weather, I shout, shaking an angry fist. I’ve got a schedule to follow here – this will not do! (Thankfully this occurs only in my head.) But after four months in Scotland, I’m beginning to accept what the weather throws at me with equanimity. First it was rain. It rained with such regularity for a spell in the Hebrides that I stopped bothering to peer out the window to see if I needed my waterproof jacket before I set off. I just wore it, along with my perpetually wet running shoes. Nothing bad happened. After that, strong winds swept over the islands, making a mockery of my tempo runs. I felt as if I were running on the spot rather than achieving the required seven-minute-mile pace and afterwards, my watch showed I wasn’t far wrong. The coach in me said it didn’t matter – the effort level was still tempo - but the runner in me was appalled. Then came hailstones. They pinged out of the sky, stinging my cheeks and making tiny holes in the muddy verges as I battled along thinking ‘this is ridiculous,’ but finding myself laughing all the same. We travelled to the Coigach peninsula to take part in the local half marathon. The day before the race – the sort of day about which people up here say ‘it’s a wee bit blowy, eh?’ – we climbed the slopes of Stac Pollaidh, its rocky crest etched against the creamy sky. It swept me off my feet – literally, and more than once. How on earth was I going to run a race in these conditions? Having now completed the stunningly beautiful and arduous race, I can attest that running along an exposed Atlantic coast road into a headwind is as miserable as it sounds; but running effortlessly up a hill with the wind’s cheeky hand on your behind more than makes up for it. A few weeks later, in the hills above Loch Ness, I woke up to snow. Snow that obscured the trails I was just beginning to get familiar with. Snow that blinded me to the undulations of those trails, and concealed iced-over puddles and fallen branches with its icing-sugar topping. First I pussyfooted through it, tense and cautious and ready to break into a walk at the slightest hint of a slip. But my confidence grew daily and soon I was running almost as if it wasn’t there. While I can’t claim to have made peace with the weather, I have learned three things about it during my time in Scotland. First, if you let it dictate your running plans, you’ll never get past the front door. Second, it’s never as bad as it looks – and even if it is, it’ll soon pass. And thirdly, it’s good for you. It might not seem that way when the wind is like a wall and the ground has turned to liquid beneath your feet. But all those times you’re out there running in extreme conditions you’re banking toughness as well as stamina and strength, which will stand you in good stead whatever the weather. I did mile reps this morning. It was raining steadily when I set off and I only noticed that it had stopped when, after the last rep, I turned for home into a winter sun so bright it made me squint. The rain-soaked surface of the road gleamed like polished silver. My times weren’t bad either. It seems that all forms of weather – not just clouds – have a silver lining.